Is this a Hubble image of a distant nebula of gas and dust swirling swirling around a giant star factory? No, it's better than that, it is almost a hole in clouds over Potugal, separating an observer from Earth's lovely Moon. Here is Michael's description: Image obtained on Halloween night. 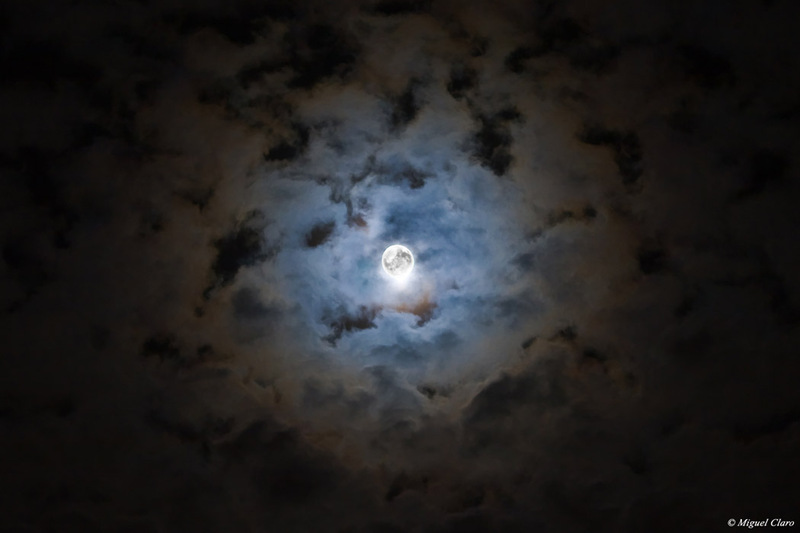 The Moon was covered by a layer of clouds with a slight haze, which led to a decrease in intensity in the light of the Moon and refractive possible ice crystals that produced a diffuse lunar halo effect. To get a good exposure for both, the impressive clouds as well as the Moon, two images were taken with different apertures, processed separately and later combined. The final result is a ghostly Moon in a night of witches, well known as "Halloween" night, but I preferred to call "The Moon Halo-Win". Canon 400D ISO 400 70mm APO lens F/4.5 Exp. 1/4 " in 31-10-09 at 20:10 and 20h13. For the second image the aperture is F22 with Exp. 1/10. Combined in Photoshop CS3. This page was last modified on 12 January 2019, at 02:03.